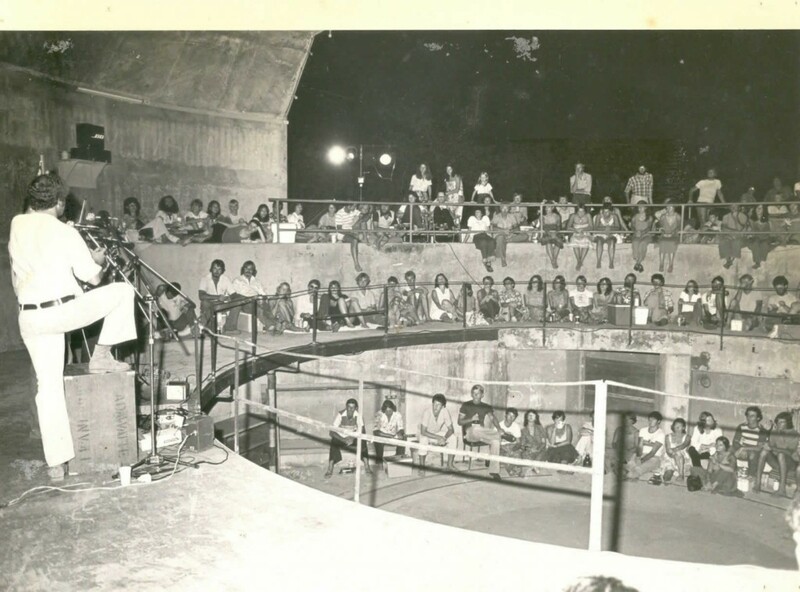 The Top End Folk Club began with an inaugural meeting on 14 April in 1971. Early members included Ted Burns, Dr Lionel Crompton, Alex Green, Glenn Gaskill, Paul and Vinny Lawler, Bazza Martin, Guy Nichols, Sondra Saunders, Margaret Mile, Paul Stewart, Ev Whitaker, Josh Baker and Deirdre and Michael Mills, but there may have been others. Initially, concerts were run at a number of venues, including the Greek Hall in Cavenagh Street. However, it was not long before regular concerts began at the East Point Gun Turret – the one that is now part of the Darwin Military Museum. The “old” Gun Turret was part of the old museum run by the Artillery Association and undeveloped, so the Association was happy for the Club to use it. The acoustics in the Turret were perfect for singers and players and the Association employed a caretaker on-site, which enabled some equipment to be stored securely. 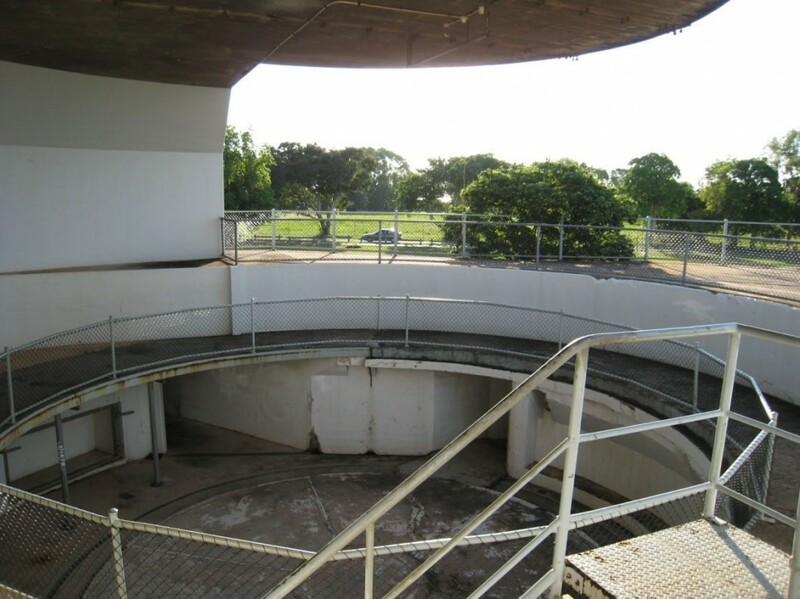 The “stage” was at the back of the Turret facing the sea, with the audience sitting between the edge of the gun pit and the edge of the front terrace, with a couple of metres drop on both sides. Given the rudimentary fencing, it was miraculous on crowded nights that nobody ended up in an ambulance. The few who did fall over either of the edges appeared largely unaffected and simply grabbed another beer. 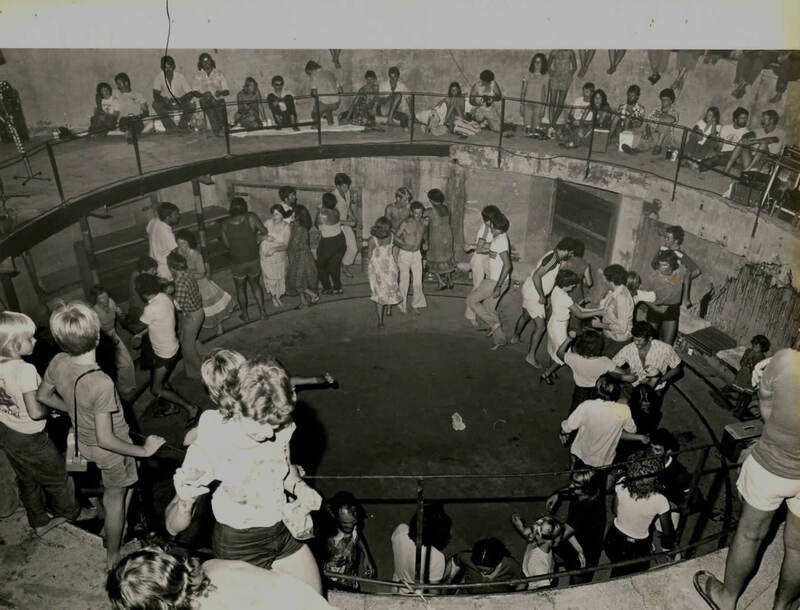 The gun pit below the stage was empty and proved a suitable, though pretty rough, dance floor when folk dancing developed on a regular basis. The Sunday night concerts grew to be very successful as there was little or no entertainment competition on Sunday nights. As the membership expanded and more equipment was acquired, the Club became incorporated. The Club hosted artists touring Australia at special concerts, as well as supporting charity events in and around Darwin. Hundreds of folkies attended the special concerts. At an afternoon concert at the 1983 Top Half Festival there were well over 300 people crowded in. However, a cloud appeared on the horizon in the early 1980s when it became clear that the Artillery Association wanted to reclaim the Turret so that a replica of the original WWII gun could be installed and the museum significantly expanded. The Club then targeted the other Turret at East Point and eventually obtained a lease to use it. The Club also obtained grants from the NT Government to provide power and some level of security, since the structure was open to anyone. The quality of local performers has been well recognised over the years. Groups have included Bludger O’Toole, The Bilge Ratz, the Darwin Ceili Band, Prickly Heat, Firkin’s Merkin, Tropical Ear, Mna, Murphy and Friends, No Strings Attached, Mixed 4 Tunes and The Fettlers. Noted individual performers include Paul Lawler, Christine Charles, Dave Bowers, Smokey, Sean Byrne, Maggie Kent, Jeff Corfield, Tony Suttor, Peter Bate, Chris Pemberton and Sue Ross. Apologies to any group or individual if they have been missed – let us know. Last but not least, Paul Stewart has been staging his workshop entertainments at the Top Half Festivals since 1976 along with his “Friends”, usually comprising a cricket team of carefully selected singers and players from the Territory and interstate. Unfortunately this didn’t last. Vandalism at the Gun Turret was such that there was a constant need to repair lights and power fittings. In the absence of any real security the Club had to give up the Turret and transfer regular meetings to hotels and clubs. Over the years the Club’s venues have included Shenannigans, Kitty O’Sheas, Dolly O’Reillys, the Alawa Scout Hall and The Rock climbing gym at Doctor’s Gully. For the past four years the Club has had an arrangement to meet at the Railway Club in Parap. 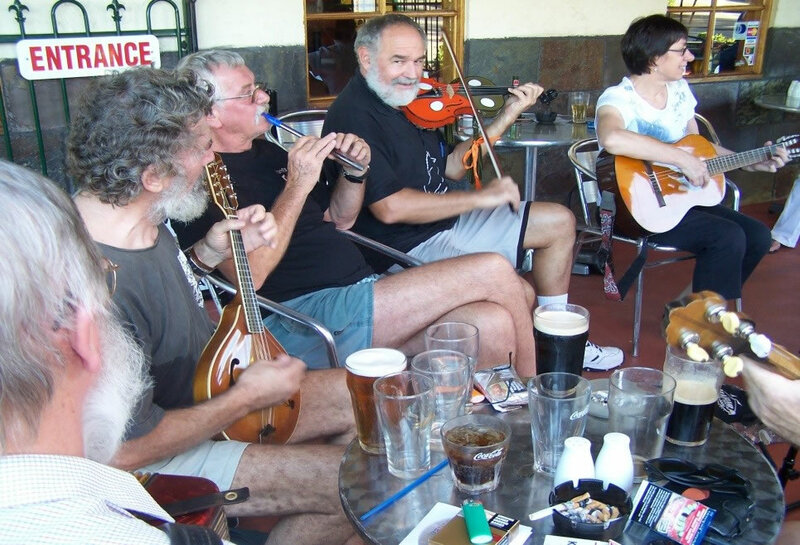 As Darwin was changing and growing there has been considerable competition to the Sunday folk club meetings as entertainment is now available at various venues every night of the week. The mass folk audiences of the 1980s went elsewhere. In terms of events, the Club is now focused on the Top Half Folk Festivals, one of which is held in the Top End every two years, the regular Sunday sessions at the Railway Club and the occasional touring artist concerts which the Club promotes.